Its a new year and Placid Waters is already planning for a great summer season. We will be offering kayak lessons, day trips, Stand Up Paddling, and again this year custom trips that include an overnight at an Adirondack Inn or campsite. 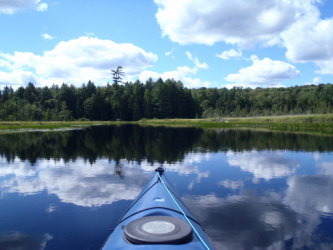 Placid Waters Kayaking is located in the beautiful Adirondack Park of New York State. The Adirondack Park contains 6.1 million acres which includes a protected Forest Preserve of approximately 2.3 million acres. About 43% of the land is owned by the state with 57% in private holdings. The Adirondacks contains thousands of streams, brooks and lakes and is a significant canoe and kayak destination. Needless to say we have a lot of great paddling ! 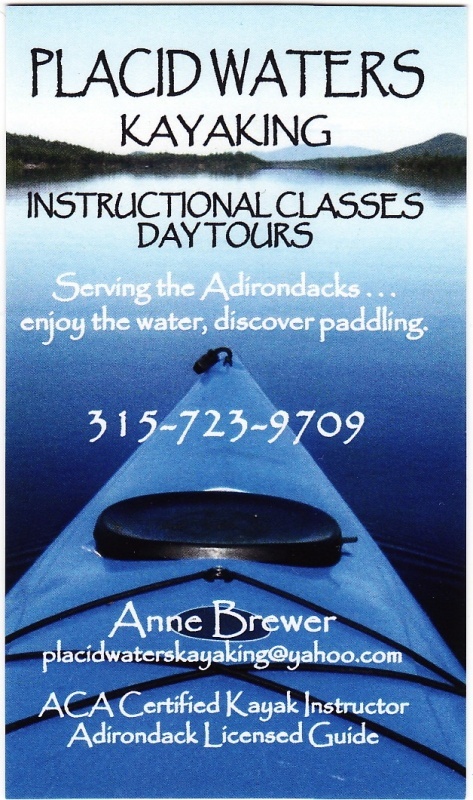 My name is Anne Brewer and I am the owner of Placid Waters Kayaking and I invite you to join me for a paddle, either in an instructional class or for an Adirondack Lake day trip. I am an ACA certified instructor, a Licensed Adirondack Guide and certified as a Wilderness First Responder with Wilderness Medical Association. I have been kayaking for 12 years and I love the chance to introduce people to the sport and to share some of the beauty of the Adirondacks. 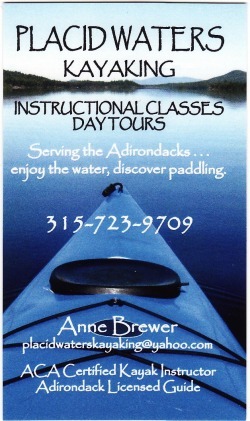 Serving the Adirondacks....enjoy the water and discover paddling. There is no better time to learn how to kayak.